Batteries are heavy. There’s simply no getting away from that – whether those in question are traditional lead acid, nickel metal hydride or lithium ion. So if you want a battery electric car, you need to expect it to weigh a lot. Or have a range that extends only to the local corner shop. One man very well aware of the battery weight trade-off of all-electrics is Les Puklowski. Les has been converting cars from petrol to electric for many years – in fact, he claims to have done more conversions than anyone else in Australia. Most of the conversions Les has done are based around small, cheap cars – in times past he converted plenty of Daihatsu Miras and he’s now doing some Daewoos. But for his own fun machine, he’s taken a very different approach. As the pics show, when we caught up with Les the car wasn’t finished - but in a way that’s a good thing as it lets you see clearly the car’s technology and construction. 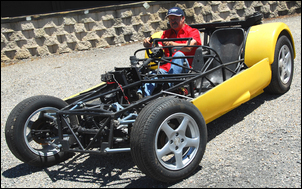 The car that Les is building is based around a Clubman-style frame, except with a rear mounted motor. The frame is built from a mixture of round and square section mild steel tube and is to be clad in fibreglass panels. All-up weight is expected to be around 400kg. The 6-inch Advanced DC electric motor is bolted to a Daihatsu Charade gearbox. 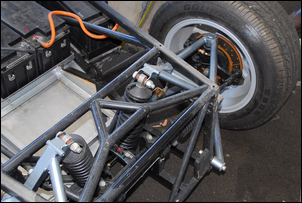 In fact, the whole rear suspension and drive has been taken from the Charade – McPherson strut suspension and all. As the gearbox has been rotated so that its gearchange faces forward rather than the rearwards original location, you’d then expect the car to have 5 reverse ratios and one forward. But with an electric car that doesn’t matter – you simply reverse the ‘normal’ rotational direction of the electric motor. 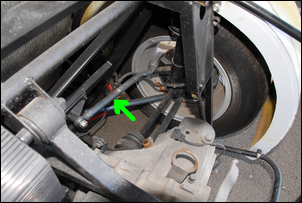 To prevent the rear wheels from steering, Les has added toe-control links (arrow). Of course the Charade braking system doesn’t feature a handbrake but Les is sourcing Daihatsu Applause ancillary handbrake calipers. Front suspension comprises fabricated double wishbones. 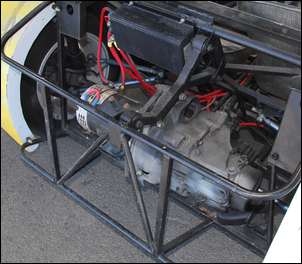 These use thick-walled mild steel tube with Holden Gemini uprights and brakes. Happily, the Charade and Gemini stud patterns are the same, so front and back stud patterns match. 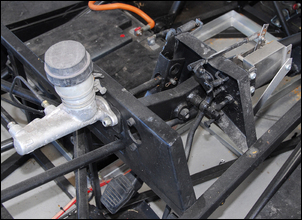 A Gemini steering rack is used; it was shortened so that the tie-rod inner balljoint positions give the correct lack of bump steer. 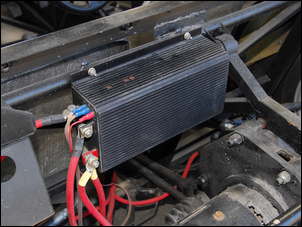 ... the Curtis motor speed controller. This is a stepless controller that allows motor power output to be infinitely varied. 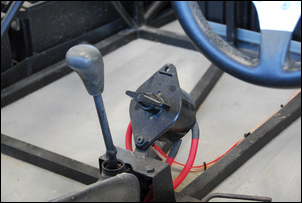 However, if anything goes wrong, Les can turn the master battery ‘off’ switch located next to the gear lever. 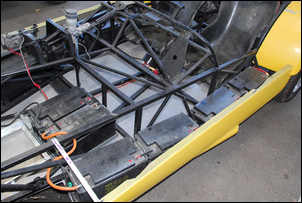 The ten 12V 60 amp-hour batteries are distributed around the car, giving excellent front/rear weight distribution and a low centre of gravity. So that’s the mechanical and electrical make-up of the car. And what about its performance? The current 6-inch, 28hp motor will be replaced with an 8 inch, 83hp unit, giving a potential power/weight ratio of about 200hp per tonne. Even with plenty of electric torque, that won’t give supercar performance – but it sure as hell will be handy!